The issue with leaving an unused port open is the path for RF egress and ingress, which can affect the entire upstream data path for many subscribers within that area and result in costly service calls. Case studies have shown that terminating all unused tap ports in an average size node can result in a signal-to-noise improvement of more than 5db in the return path, as well as eliminating micro-reflections. Electrically terminating unused ports inside the home on wall plates or actives and passives also blocks ingress in the return path. With the rise of digital CATV, service providers and technicians are no longer concerned with removing cables from a tap after a subscriber cancels their service, so they simply leave them connected at the tap and turn the service off digitally. This also causes similar issues with RF egress and ingress. If the cables were removed and properly terminated, this could be avoided. When a technician doesn’t properly terminate a port, environmental elements will corrode the port over time. 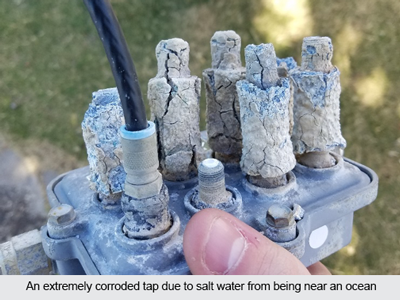 With this corrosion, no cable can be connected to it again, forcing a technician to install a new tap. Not only does it add to costs for the company to purchase a new tap, cables and connectors, but it also takes additional time out of a technician’s schedule to complete the service. Subscribers in the area may also see an interruption of service while this installation takes place. If a terminator with an integrated weather seal was used on the port instead, corrosion could be avoided, making it usable again once the terminator is removed. A new tap can be costly for the service provider and causes a messy jumble of cables at the drop. Take these photos for example. With a significant number of taps and cables concentrated in a small area, it can be difficult for technicians to decipher which ports belong to which homes in the neighborhood. A properly-terminated port can help clear a nest of cables like this one, and make the technician’s job much easier. A terminator with a bold color is also beneficial to technicians because it’s much easier to see which ports are terminated from the ground. Terminators are important for technicians to use on taps to better the broadband network performance for subscribers, avoid corrosion at the tap, and help organize the cable system at the drop. The type of terminator best used for this purpose is a non-locking terminator that has an appropriately-sized center conductor wire gauge, weather protection and good grounding contact. This terminator is much less expensive than correcting any of the issues listed above, and only takes seconds for a technician to install.